This program can be used by anyone with basic music knowledge as a reference to the Musical scales (modes) used in popular Greek music. Greek musicians rely on the knowledge of these scales, especially those who play the Greek bouzouki instrument. You may find that many of these scales are also used in other cultures, and may be known with different names. More features may be added as required in the future. PC running Microsoft Windows operating system; Windows XP, Vista, 7, 8 and 10. Instructions provided within application for how to configure Windows to enable the Greek language. Unfortuntalely this software is not available for OS X (Apple Mac) or for iOS (iPad/iPhone) etc. Run the installer and complete installation. This will also create a desktop shortcut. Run the program from the provided desktop shortcut. OUSAK is an experienced Greek bouzouki player and instructor, and an IT professional. His knowledge of Greek music theory and computers was the result of this program. 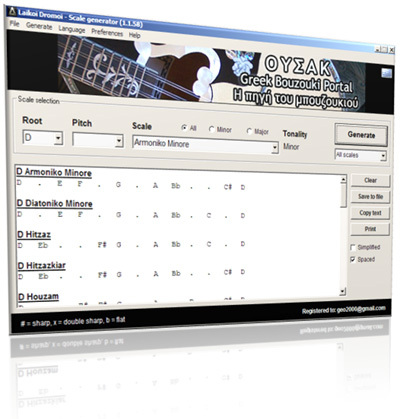 OUSAK is known in Greek music forums where he has provided years of help to others interested in Greek music, especially in regards to the scales. After getting frustrated with books and online resources that only provided scale definitions from the D key, and in specific formats or language, he decided to create this fully transposable scale generator as a musical tool which will help those seeking to learn and reference the "Laikoi Dromoi". This software was originally released 6th of January 2011 as shareware, and then re-released as freeware on 15th of August 2015 as a gift from OUSAK to you.